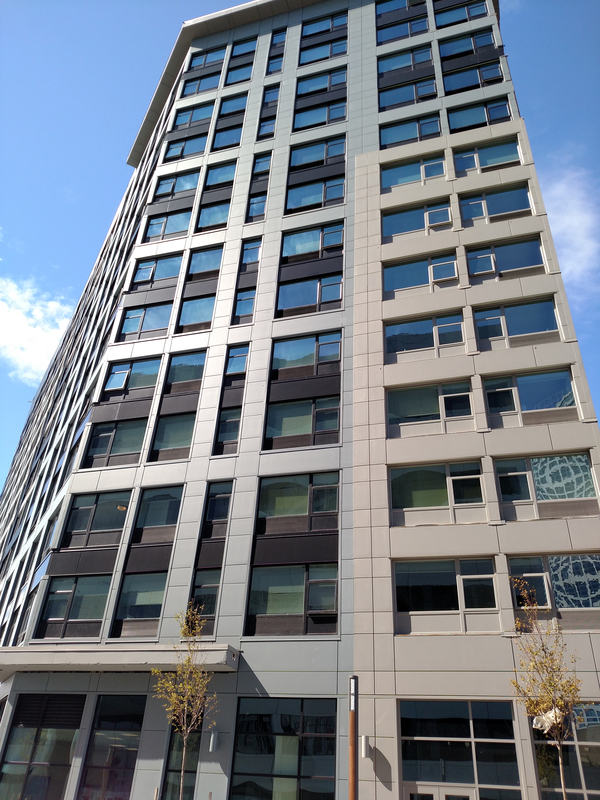 Opened in June 2017, 3 Journal Square’s mixed-use 240-unit apartment building attracts New Jersey’s young professionals with a high-style aesthetic, modern performance and LEED® Silver certification. Hospitality-minded amenities include housekeeping services, a dog run, a yoga studio, curated art collection, 24-hour concierge services, a party room, ground-floor retailers and a rooftop deck with Manhattan skyline views. Framing the urban views and daylit interiors, Winco Windows supplied its 8250 Infinity Series windows, finished by Linetec, for the property’s 628 daylight openings. Designed by Marchetto Higgins Stieve Architects, modular blocks of color define 3 Journal Square’s exterior, reminiscent of Mondrian’s artworks. Brought to life by Tocci Building Corporation, this geometric format gives the 13-story, 220,000-square-foot structure a more approachable scale. This modularity also is evident within the 10-by-7-foot daylight openings, which are composed of several rectangular window units. Contributing to product resiliency and beauty, Linetec applied a dual-color, painted finish to all of Winco’s windows, complementing the 3 Journal Square’s design across all planes and palettes. On the windows’ exterior, a light gray color was used to match the inset building façade of the same hue. Contrasting with this lighter portion, the surrounding exterior walls mask their size in dark gray and blue tones. Within these sections, a black finish emphasizes the outline of each window unit. On the interior, an ivory color was selected for its subtle ability to blend with most décor. The light gray, black and ivory finishes were blended in-house at Linetec and formulated using 70 percent PVDF resin-based coatings. As an environmentally responsible finisher, Linetec applies these high-performance painted coatings in a controlled facility that safely captures and destroys the VOCs present in liquid solvent-based paints before the finished products’ arrival on the building site. Under Linetec’s stringent processes, these finishes meet the American Architectural Manufacturers Association’s (AAMA) 2605 industry standard, as well as minimize buildings’ maintenance costs and maximize long lifecycles. Further contributing to the project’s sustainability goals, the aluminum used to produce Winco’s windows is an 82.5 percent recycled-content aluminum billet composition. After its useful life on the building, the aluminum framing members are 100 percent recyclable. In addition to reducing waste, enhance visual appeal and improving durability, Linetec’s thermal improvement services also supporting LEED Silver criteria for energy-efficiency goals. 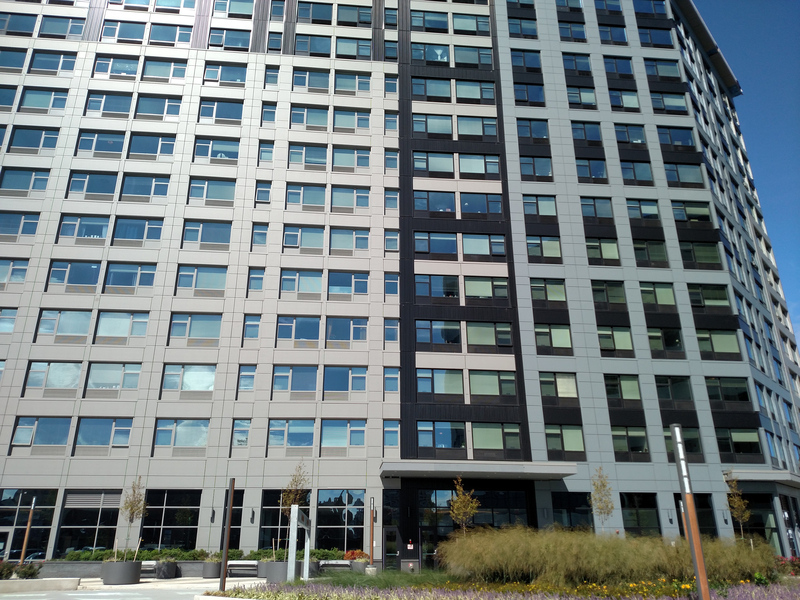 For 3 Journal Square, Linetec added the insulating, thermal, polyamide strut to Winco Windows’ aluminum framing members. The strut separates the inside and outside metal, which greatly enhances a window’s thermal performance. This thermal break reduces the amount of heat transfer, therefore saving energy and increasing occupant comfort. At Linetec, thermal strut also presents a cost-effect opportunity for dual finishing options, such as specified on Winco’s windows. Since the 1920s, Jersey City’s Journal Square has been a business, transportation and entertainment hub. The Square earned its moniker as the site of The Evening Journal, and later, The Jersey Journal. In recent decades, the future site of 3 Journal Square had remained vacant for more than 30 years. Developers Hartz Mountain Industries and Panepinto Properties purchased the property from the City with a vision for revitalizing the area. The recipient of an Urban Transit Hub tax credit and a tax abatement from the Jersey City, 3 Journal Square is part of the 244-acre Journal Square 2060 Redevelopment Plan. The Plan’s purpose is “to foster the redevelopment of Journal Square, Jersey City's central business district, by providing for transit-oriented development of new housing, offices, commercial, and public open spaces within walking distance to the Square and transit facilities.” Located steps from the PATH Station, 3 Journal Square connects tenants to Manhattan in 10 minutes. Most residents have little need fro a car as the property boasts a Walk Score of 98 out of 100. A few units remain available at 3 Journal Square. Property manager, Greystar Real Estate Partners, showcases studios, one-, two- and three-bedroom units with rents starting at $1,915 for a studio and $4,100 for a three-bedroom.